When the opposition alliance, the Coalition for Reform and Democracy, holds its political retreat to map out strategy at the beginning of September, its leaders will struggle to hold together the unwieldy organisation. The question likely to haunt CORD activists at the meeting is why the opposition has been so ineffective in winning popular support against a government that has failed to tackle worsening corruption and terrorist attacks. Many of the answers lie in the poor relations and poor communications among the leaders and parties in the alliance. 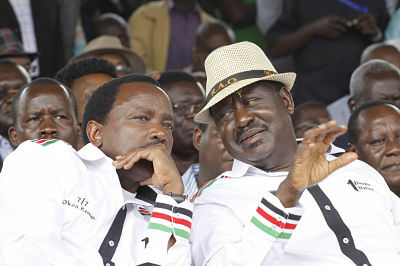 These are Raila Odinga of the Orange Democratic Movement (ODM); Stephen Kalonzo Musyoka of the Wiper Democratic Movement-Kenya (WDM-K); Moses Simiyu Wetangula of the Forum for the Restoration of Democracy-Kenya (Ford-K); and Martha Wangari Karua of the National Alliance Rainbow Coalition (NARC). To say there is a massive deficit of trust between the four main leaders is an understatement. So serious is the rivalry at the top that few believe the current alliance will survive in the run-up to the 2017 elections. Effectively, campaigning will start next year. Hats off to Nigerian magnate Aliko Dangote. Amid global panic about China's imploding stock market and the plunge in the price of oil, Nigeria's top export, Dangote chooses to announce a US$4.3 billion joint venture with China's Sinoma to build cement plants in eight African countries. Dangote always knows exactly what the markets are doing, so his timing is likely to have been deliberate. Like China, Dangote is playing the long game. Neither side wants to put their plans on hold because of the current market crisis. Confidently predicting that all the new factories will be operating within two and half years with a production of capacity of 70 million tonnes a year, Dangote says he will add a further 30 mn. tonnes by 2020. Dangote wants to challenge France's Lafarge cement conglomerate for market supremacy within and beyond Africa. Although Nigeria's growth rate has slumped to 2.4%, and Beijing's economic restructuring is hitting turbulent waters, there is a logic to Dangote's big China deal. Cement is a bet on the dynamism of Africa's internal market: that regardless of commodity and share price roller-coasters, demand from the world's fastest growing population for new houses, offices and factories is set to outstrip supply for years to come. It also looks like the next stage in China-Africa relations – joint-ventures for manufacturing companies that will play a leading role in modernising African economies and weaning the continent from its dependence on primary commodities.